Easter Eggs From The Pixar Film Monsters, Inc.
Monsters, Inc. is by far one of my all time favorite Pixar movies and I could watch it over and over, it never gets old. Everytime I watch it though, I see something new. I always notice little references to other things in other Pixar movies or as I like to call it the Pixar Universe. Now I won’t go into details about the Pixar Universe theory with this post, I’ve done it in another blog. Now you may wonder what is a Easter Egg doing in “Monsters, Inc.” I didn’t mean the colored hard boiled eggs we are use to at Easter time. I’m speaking about something that is put into a film by the creators as either a inside joke, hidden message or possibly a reference to another movie, these are called “Easter Eggs”. So now that we have established the setting for this article, lets continue. 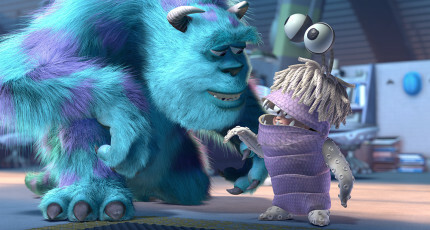 Just to set up the timeline a bit, “Monsters, Inc.” was the 4th film released by Pixar. The first 3 were “Toy Story”, “A Bug’s Life”, and “Toy Story 2”. “Monsters, Inc. was released November 2, 2001, but the film was something the directory Pete Doctor had been working on since 1996. One of the biggest Easter Egg scenes in “Monsters, Inc. take place toward the end of the film when Sulley takes Boo back to her room. Boo starts handing her toys rapidly to Sulley. In this scene you will see the famous Luxo Ball. This ball has become the icon of the Pixar Studio and you will see it often in Pixar films. The ball originated from Pixar short “Luxo Jr.”. Sulley rapidly receiving toys from Boo gets Jessie from “Toy Story 2”. You will also see a plush Nemo from “Finding Nemo”. Now at this time you more than likely didn’t know the clown fish and what reference it had. “Finding Nemo” would be the next film released by Pixar in May 2003. This is just one of a few references in “Monsters, Inc.” to the future film. Nemo can also be seen on Boo’s couch throughout the film. Nemo also appears in a picture on the wall at the restaurant Harryhausen’s. Also if you look through one of the open doors at Monsters Inc. you can see Nemo on a wall plaque. Now another Easter egg you may have missed happens when Randall is trying to practice his blending into any background. The second background to go past is the Cloud Wallpaper we know from Andy’s room in Toy Story. Does this mean that Randall was Andy’s monster also? Next Easter Egg, do you remember the scene late in the movie where Sulley is ready to toss Randall through a open door and he lands in the human world in a trailer. Now it turns out that the exact same trailer used in “A Bug’s Life”. Now if you look in the trailer scene you will also notice another Pixar Easter Egg. The Pizza Planet Truck appears in the scene next to the trailer. A little Pixar trivia is that the Pizza Planet Truck appears in every film except “The Incredibles”. Another Easter Egg that is across all the Pixar movies is that John Ratzenberger plays a character in the film, he voices The Abominable Snowman . John has been in every Pixar movie to date. You probably remember him as Cliff Clavin from the show “Cheers”. Disney didn’t purchase Pixar till 2006, but there are many people who have found references to Mickey or Hidden Mickeys in the film. There is a Mouseketeer hat that appears in the opening credits, in the crowded closet. A hidden Mickey seems to appear when Mike and Sulley are leaving the Himalayas in a snow cave just behind Sulley. Also, in Boo’s room it appears there is a Mickey drawing on her easel. Now an Easter Egg you may have seen and didn’t even realize it was one, toward the end of the film Mike is looking at a magazine and the back of it says “Scare Different”. This is very similar to the Apple slogan “Think Different”. The Easter Egg here is the shout out to Apple and its founder Steve Jobs. Steve was the person to help finance Pixar in 1986 when the division broke away from Lucasfilms. Did you know that Pixar started out as a part of Lucasfilms in 1979? When Pixar was sold to Disney, Steve Jobs stayed involved and became the largest shareholder of Disney. Just one last thing I wanted to mention about “Monsters, Inc.”. You have probably always noticed that numbers that appear in films and tv always begin with 555. This is a way to ensure that someone’s phone number isn’t shown to the world. In “Monsters, Inc.” during the scaring simulation at the end of the scene an indicator flashes the number 510-752-3000 which just happened to be the main number to Pixar. So are there any Easter Eggs you know that I missed? Feel free to share them.